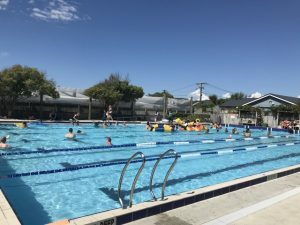 Only open in the summer months, these outdoor pools are great on a warm, calm day! With 3 different pools and a splash pad there is something for everyone. The splash pad doesn’t have any standing water so is safe for littlies of all ages. There are buckets, fountains and spouts of water, buttons and wheels to operate the water. There’s also a small, shallow toddler’s pool under a shade sail. There’s a slight slopping decline with the water becoming roughly ankle deep (for adults). 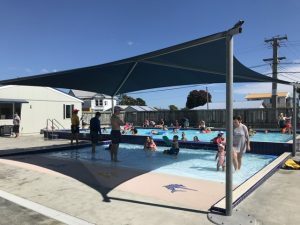 Next to the toddler’s pool is a leisure pool which is 80cm deep throughout and heated to around 27 degrees (although this changes with the air temp). This often has floaties and inflatable rings for kids to play with and is aimed at those under the age of 10 years. The main pool is 25m long and is deeper and cooler (approximately 25 degrees) with a mix of lane swimming and leisure area. At the weekend and during the holidays, there are usually some big inflatables including an obstacle course, or ‘Aquarun’. There’s a small area of grass and plenty of bench seating around the pools. There’s a huge recreation ground opposite – perfect for ball games, tag or kite flying. There’s a playground (including fort) at the far end, just in case anyone has any energy left after their swim! And if you’re hungry afterwards, you might want to think about grabbing a pizza or bowl of pasta from La Bella Italia. Address: 79 Udy Street, Petone. Small car park next door or free street parking all along Udy Street. Open: Summer opening only – roughly November – mid March hours vary depending on if it’s school holidays or not. Generally open Monday – Friday 11am – 6pm or 7pm (holidays) and Saturday & Sunday 10am – 6pm. See here to check opening times for your specific date. Prices: Adult $5.50, Kids $3.50 – adults don’t pay if you’re with a kid under 8 years old. Family Pass $18 (2A+4K). Spectator fee $2.